Coworking spaces are not new in the city. In fact, wherever you look, chances are you will find one. Especially in the CBD and Ayala area, they are everywhere! Spaces Makati is not the first in the country. The first one is at a penthouse in High Street but the second location in the metro is a first of its kind because it is a standalone building. I had an easy time locating the building because it is right across Greenbelt along Arnaiz. As soon as I opened the door, its airy environment welcomed me. 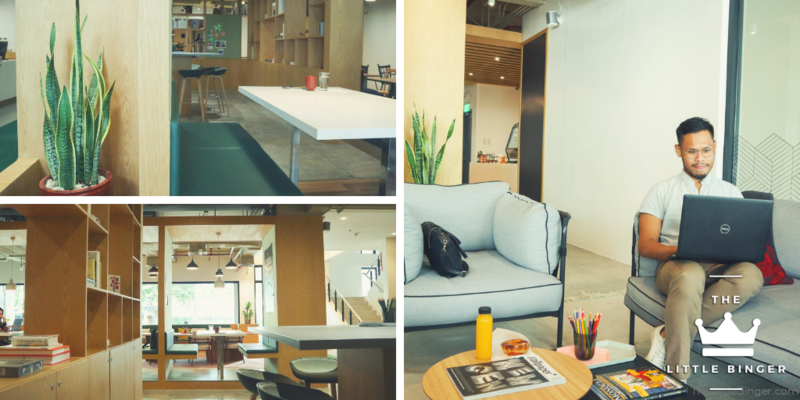 The first floor which I explored the most has several nooks and desks for freelancers and individuals looking for a new coworking space. Meanwhile, the second and third floor are rooms for companies or groups. After roaming around and taking the vibe of the place in, I settled down at a desk by the window. As I looked around, I noticed the pretty interiors. I am a sucker for minimalist designs and solid colors and Spaces Makati employs just that design. A friend who is also a regular told me that Scandinavian design inspired the place and that the pieces of furniture were imported abroad, thus the authenticity of its Scandinavian look. As I spent an afternoon in Spaces Makati, I noticed few interesting things about it. One is the collaborative nature of it. Spaces puts the ‘co’ in ‘coworking spaces’ because of its activities for its members which give them opportunities to mingle with one another. Honestly, as someone who enjoys meeting new people, I loved the idea of it. A busy bee needs to refuel and that will not be an issue in this coworking space. Little Flour will replenish anyone’s hunger and thirst with their pastries and drinks. Coffee and water are also offered for members. NEXT POST Next post: "Shazam!" Is the Most Fun DC Movie Yet!